Febrile seizure (FS) is the most common type of convulsive disorder and one of the most recorded causes of emergency hospital admission in children under 5 years of age. In spite of having a good prognosis, FS is extremely frightening, emotionally traumatic, and anxiety provoking when witnessed by parents, which make it a very difficult condition for them to deal with. Concerns about the future health of the child are the most common causes of fear among the parents. Sources of concern include fear of recurrence, physical disabilities, mental retardation, and even death. During seizure, the parents may think that their child is dying, but fortunately, most of febrile convulsions are benign rarely have FSs caused brain damage, and except developing countries, there are no documented cases of febrile convulsions-related deaths on record. The best approach for FS should include establishment of a good communication with parents and have to improve their responses to convulsions at home; it is of specific importance that the families are relieved of their fears and become capable of intervening optimally with the disease. This cross-sectional study was carried out at two hospitals in Al-Hillah city, Babylon Teaching Hospital for Gynecology and Pediatric and Al-Noor Hospital of Pediatrics, Babylon Province, Iraq, from March 1, to August 1, 2018. This study included a sample of 100 parents of children with FS who attended the emergency department in Babylon Teaching Hospital for Pediatrics and Gynecology and Al-Noor Hospital who agreed to participate in this study. The mean age of children was 17.67 ± 15.18 years ranging from 3 months to about 6 years. The mean maternal age was 27.81 ± 8.21 years, while the mean paternal age was 31.29 ± 6.59 years. Male children outnumbered female children by a percentage of 63% as compared to 37%. Concerning residence, the balance tips more in favor of urban residence (54%), while the rest live in rural areas, which represented 46%. Regarding educational level of the mothers, 70% of the mothers were either illiterate or had a primary level of education. [Table 1] depicts the parental and child's sociodemographic factors. Children aged 6–12 months were more likely to have the first episode of FS (37%), while children aged 13–24 months also have a higher albeit less than the first age group (32%). In decreasing percentage, the first episode of febrile convulsions was experienced in children aged <6 months, 25–36 months, and more than 36 months as 14%, 11%, and 6%, respectively. The number of episodes experienced by parents was one episode in 69% of the cases, 2–4 in 20% of the cases, and more than four in 11% of the cases. In this study, 92% of persons who filled in the questionnaire were mothers. 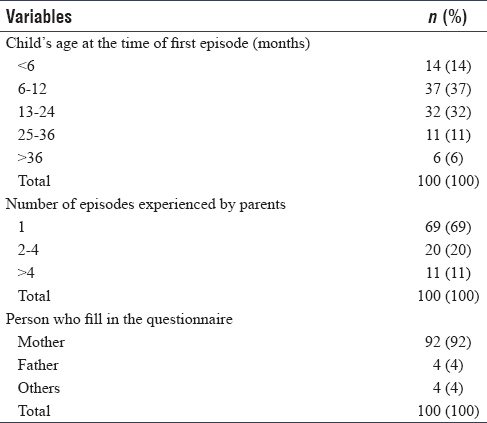 [Table 2] shows the distribution of child's age at time of first episode, number of episodes experienced by parents, and person who filled in the questionnaire. [Table 3] shows the correct and incorrect answers of the questions of knowledge of the respondents regarding febrile convulsions. [Table 4] shows the correct and incorrect answers of the questions of practice of the respondents regarding febrile convulsion. This figure depicts that 43% of the respondents had good knowledge regarding febrile convulsion, while those who had poor or fair knowledge were 17% and 40%, respectively. The score of knowledge is 6.55 ± 2.81. There was a significant association between (residences, maternal educational level) and knowledge score, P = 0.045 and <0.001, respectively. 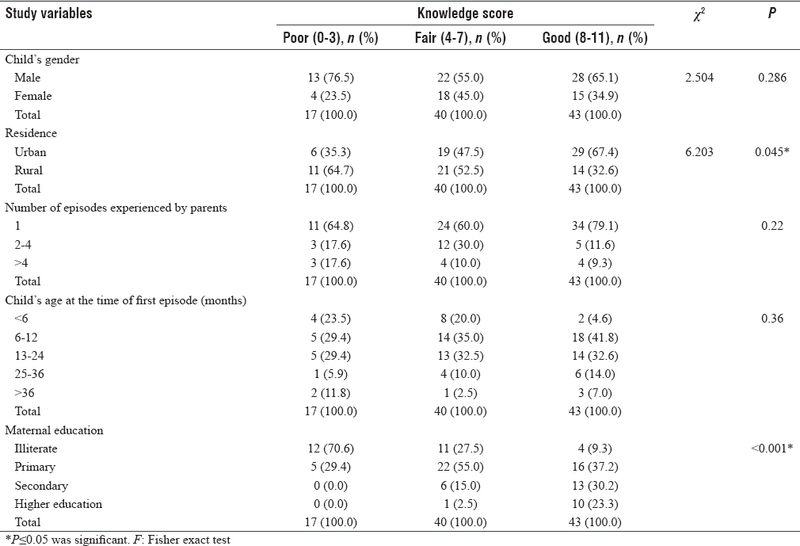 [Table 5] shows that Chi-square test/Fisher's exact test was conducted to show the association between variables which included child's gender, residence, number of episode experienced by the parents, child's age at time of first episode, and maternal education and knowledge score which included poor, fair, and good. There is a significant association between number of episode experienced by parents and practice score, P = 0.029. [Table 6] shows that Chi-square test/Fisher's exact test was conducted to show the association between variables which included child's gender, residence, number of episode experienced by the parents, child's age at time of first episode, and maternal education and practice score which included poor, fair, and good. [Table 7] shows that ANOVA (F-test) was conducted to show mean differences of maternal age according to knowledge and practice score. There was a significant mean differences in both circumstances, P = 0.003 and < 0.001, respectively. 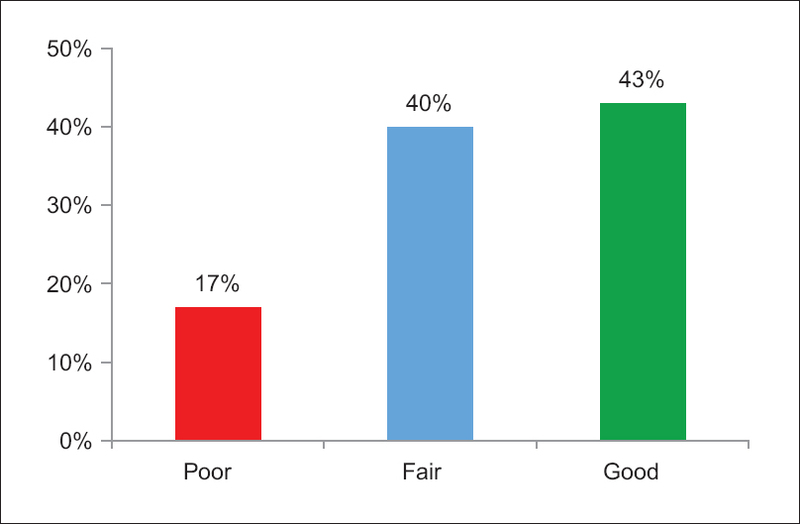 This figure depicts that 43% of the respondents had good knowledge regarding febrile convulsion, while those who had poor or fair knowledge were 17% and 40%, respectively [Figure 1]. The score of knowledge is 6.55 ± 2.81. 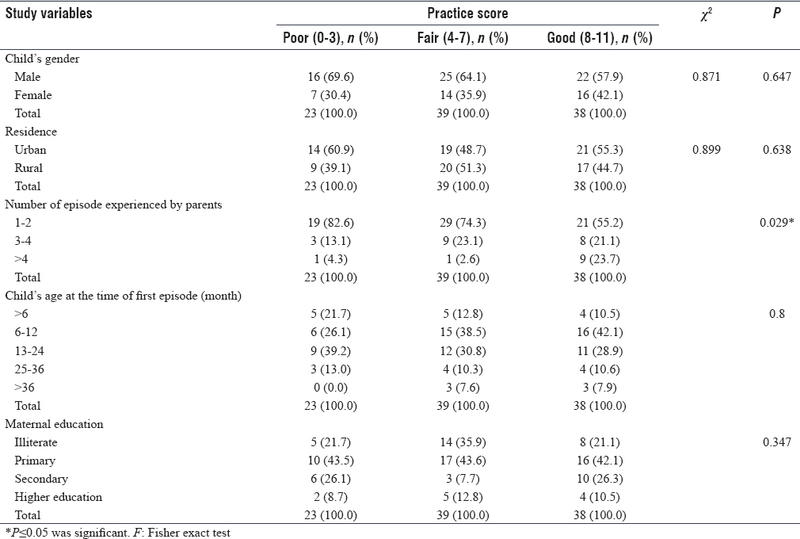 Regarding distribution of the practice score regarding febrile convulsion, [Figure 2] depicts that 38% of the respondents had good practice regarding febrile convulsion, while those who had poor or fair knowledge were 23% and 39%, respectively. The practice score is 5.8 ± 2.36. The current study showed that the mean age of children developing febrile convulsion was 17.67 ± 8.2 (ranging from 3 months to about 6 years); this comes into agreement with Sajad and Khosravi, who conducted a study in Iran which showed the same results. The participated parents in this study were with age ranging (15–43) years for mothers and 20–50 years for fathers; meanwhile, in a study done in Ghana by Nyaledzigbor et al., the age ranged from 22 to 38 and 25 to 50 for the mothers and fathers, respectively. Male children outnumbered female children by percentage of 63% as compared to 37% with ratio 1.7:1; this result is compatible to study done by Ali in Tikreet (Iraq). Concerning residence, the balance tips more in favor of urban residence (54%) and the rest live in rural areas, which represented (46%), while Nyaledzigbor et al. reported that 60% of the respondents who participated in his study were living in villages. Seventy percent of the mothers who participated in this study were either illiterate or had a primary level of education, in contrast to a study done in Indonesia by Syahida et al., which showed that the vast majority of mothers were highly educated. This might be attributed to that highly educated mothers may be more aware of seizure attack and how they should deal with it. 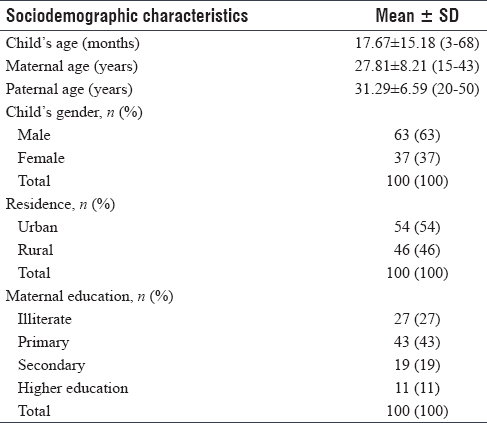 The current study stated that 69% of children were more likely to have first episode of febrile convulsion in age of 6–24 months; this comes into agreement with Sharawat who reported that the majority of FS were noted for the first time in range between 6th and 24th months of age in percentage of 60%. In addition, the number of episodes experienced by parents was for the first time in 69% of the cases and 31% had more than one attack; our result is lower than that obtained by Elbilgahy and Abd-El Aziz in Egypt and higher than the result obtained in the study by Ali. These differences may be explained by the lack of information in recording of cases which could be due to the failure of parents to describe or recognize the fit; some parents interpreted the seizure as paralysis, fainting spells, suffocation, and sometimes, they did not have any idea about it. When the respondents were asked whether febrile convulsion was equivalent to epilepsy, more than half were perceiving FS as epilepsy, and if anticonvulsant drugs were required for every child with febrile convulsion, half of them answered that it should be given. These findings are compatible with results obtained by the study done in Turkey. Therefore, parents should be informed that most FS attacks recover spontaneously with good long-term prognosis, and long-term anticonvulsant drugs can cause side effects that dominate over minor risks of FS. Recognizing the cause of FS can help parents to decrease and prevent occurrence of fit; our study showed that 80% of the respondents believed that if fever subsided can prevent attack of fit, in contrary to Parmar et al., who had reported that 77.9% of parents in Mumbai (India) did not know that seizure can occur during one febrile occasion. Sixty-nine percent of parents believed that FS attack is a life-threating event, and regarding whether it can cause brain damage or not, 73% of them thought that brain damage will occur; this result was in agreement with Barzegar et al., who reported in their study that the majority of mothers believed that FS episode is a serious condition which can cause brain damage. These results can explain the parent's fear and anxiety during attack of convulsion which makes it difficult for them to deal with. Our study showed that 66% of parents believed that FS is not relating to family history, while Abeysekara et al. reported that 54.6% of mothers in Sri Lanka considered the family history of convulsion is a factor that increases the risk of FS. Hence, parents should be informed that FS may run in families. Regarding the fate of FS, 70% of parents in our study believed that it will improve with age; Elbilgahy and Abd-El Aziz agreed with this result as she reported that 77% of Egyptian mothers believed that FS is rare after 5 years. Regarding parents' practices and how they deal with their children during the attack of seizure. Parents should observe seizure manifestation and duration in this study; 88% of parents were aware of this; Abdulla et al. agreed with this result as they did a study in Baghdad and found that 73.9% of mothers were observing seizure feature and duration. Only 25% of studied parents immediately go to the hospital or clinic at the time of their children got febrile convulsion without first aids, this may be due to parents fear that their child may die, or they may have poor understanding of the condition. This result comes in agreement with Najimi et al., who reported that less than one-quarter of the mothers took their children to the hospital or clinic without first aids at the time of FS. During attacks of fit, 64% of the parents tried to open child's mouth and put something in, believing that it may avoid biting of the tongue; in Saudi Arabia, only 32% of mothers said that they tried to keep the child's mouth open with their fingers or any other objects to prevent tongue biting. Forty-six percent of respondents who participated in this study remove discharges from the child's mouth and nose during attacks of FS which is a good action for parents to take in order to avoid aspiration, Abeysekara et al. reported that 50.6% of mothers in Sri Lanka eliminated secretions and kept the child in lateral position when the child is drooling. Regarding preventive measures of febrile convulsion, the parents had been asked if they give antipyretic to their children during any febrile illness; 85% of them had answered with yes, and regarding those whom their children had previous attack of FS, 19% of them were given prophylactic diazepam for their febrile children during any febrile occasion; meanwhile, Nyaledzigbor et al. reported that mothers in Ghana had various ways by whom they believed that febrile convulsion could be prevented at home; 60% of them indicate that febrile convulsion can be prevented by reducing fever in children by sponging, while 44% of them mentioned giving paracetamol syrup to the child having fever to prevent febrile convulsion; another 40% indicate that treating the cause of the fever can prevent febrile convulsion and only 10% of them giving prophylaxis for repeated convulsion. In general, the current study showed that 43% of the respondents had a good level of knowledge regarding febrile convulsion while those who had fair and poor knowledge were 40% and 17%, respectively, in opposing to a health survey done in Nigeria. 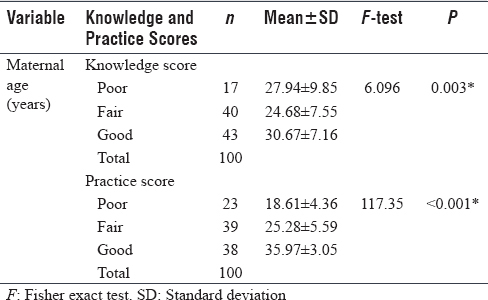 There was a mostly low level of knowledge about FS as only 10% of the mothers had adequate knowledge at baseline. Regarding association between variables and knowledge score, there was a significant association between knowledge score and residence (P = 0.047) and also a significant association between knowledge score and maternal education level (P = 0.001). A study in Malaysia showed that the correct knowledge of FSs was associated with higher maternal education level (P = 0.003), higher paternal education (P = 0.024), and higher family income (P = 0.001). 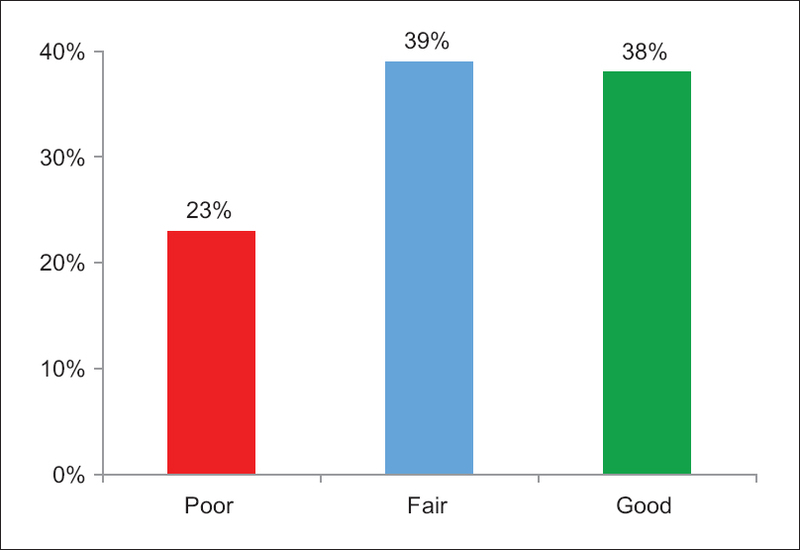 Regarding practice score in the current study and its association with variables, 38% of parents had a good level of practice and those who had fair and poor knowledge were 39% and 23%, respectively. There was a significant association between number of episodes experienced by parents and practice score (P = 0.029); another study had found a significant association between Mother's education and practice score (P = 0.0004), father's education (P = 0.001), and father's occupation (P = 0.0008). Parents' knowledge regarding FS was significantly associated with higher maternal education, urban residence, and mother age. A higher level of understanding regarding practices was shown to have a significant relationship to increasing in number of episodes experienced by parents and maternal age. Huang MC, Huang CC, Thomas K. Febrile convulsions: Development and validation of a questionnaire to measure parental knowledge, attitudes, concerns and practices. J Formos Med Assoc 2006;105:38-48. Jones T, Jacobsen SJ. Childhood febrile seizures: Overview and implications. Int J Med Sci 2007;4:110-4. Mohsen S, Mahboobeh HS. The effect of education based on health belief model (HBM) in mothers about behavior of prevention from febrile convulsion in children. World J Med Sci 2013;9:7617. Westin E, Sund Levander M. Parent's experiences of their children suffering febrile seizures. J Pediatr Nurs 2018;38:68-73. Aliabad GM, Khajeh A, Fayyazi A, Safdari L. Clinical epidemiological and laboratory characteristics of patients with febrile convulsion. J Compr Pediatr 2013;4:134-7. Oche OM, Onankpa OB. Using women advocacy groups to enhance knowledge and home management of febrile convulsion amongst mothers in a rural community of Sokoto state, Nigeria. Pan Afr Med J 2013;14:49. Sajadi M, Khosravi S. Mothers' experiences about febrile convulsions in their children: A qualitative study. Int J Community Based Nurs Midwifery 2017;5:284-91. Nyaledzigbor M, Adatara P, Kuug A, Abots D. Mothers' knowledge, beliefs and practices regarding febrile convulsions and home management 2016. J R Nurs Midwifery 2016;5:30-6. Ali AM. Iron deficiency anemia and febrile seizures case control study in children under 5 years. Iraqi J Commun Med 2008;4:285-90. Syahida JA, Risan NA, Tarawan VM. Knowledge and attitude on febrile seizure among mothers with under five children. AMJ 2016;3:649-54. Sharawat IK, Singh J, Dawman L, Singh A. Evaluation of risk factors associated with first episode febrile seizure. J Clin Diagn Res 2016;10:SC10-3. Elbilgahy AA, Abd-El Aziz RA. Effect of implementing an educational module on improving mother's knowledge, home management and attitude about febrile convulsion. J Nurs Edu Pract 2018;8:1-11. Kayser E, Ünalp A, Hurflit AP, Suna AS, Hizarcio M, Gülez P. Parental knowledge and practices regarding febrile convulsion in Turkish children. Turk J Med Sci 2008;38:343-50. Parmar RC, Sahu DR, Bavdekar SB. Knowledge, attitude and practices of parents of children with febrile convulsion. J Postgrad Med 2001;47:19-23. Barzegar M, Valizadeh S, Gojazadeh M, Jafarabadi MA, Zamanzadeh V, Shahbazi S. The effects of two educational strategies on knowledge, attitude, concerns, and practices of mothers with febrile convulsive children. Thrita 2016;5:e33411. Abeysekara MS, Weerasekara MP, Wijesena BV, Perera RA, Sriyani KA, Kuruppu NR. Mothers' knowledge, believes and practices regarding febrile convulsions and home management. Proceeding of the 15th Open University Research Sessions (OURS 2017); 2017. p. 219-23. Guedj R, Chappuy H, Titomanlio L, Trieu TV, Biscardi S, Nissack-Obiketeki G, et al. Risk of bacterial meningitis in children 6 to 11 months of age with a first simple febrile seizure: A retrospective, cross-sectional, observational study. Acad Emerg Med 2015;22:1290-7. Teng D, Dayan P, Tyler S, Hauser WA, Chan S, Leary L, et al. Risk of intracranial pathologic conditions requiring emergency intervention after a first complex febrile seizure episode among children. Pediatrics 2006;117:304-8. Abdulla MM, Abdulhadi FS. Knowledge, attitudes, and practices (KAP) regarding Febrile Convulsions among Iraqi under 5 children's mothers attending pediatric department in a teaching hospital in Baghdad. Int J Adv Res 2015;3:973-83. Najimi A, Dolatabadi NK, Esmaeili AA, Sharifirad GR. The effect of educational program on knowledge, attitude and practice of mothers regarding prevention of febrile seizure in children. J Educ Health Promot 2013;2:26. Asiri NA, Bin Joubah MA, Khan SM, Jan MM. Maternal knowledge of acute seizures. Neurosciences (Riyadh) 2015;20:346-9. National Population Commission NPC and ICF Macro. Nigeria Demographic and Health Survey. Nigeria: National Population Commission NPC and ICF Macro; 2008. p. 317-74. Deng CT, Zulkifli HI, Azizi BH. Parental reactions to febrile seizures in Malaysian children. Med J Malaysia 1996;51:462-8.